DNP ID400DC - PFS / Photo Finishers Supplies Inc. 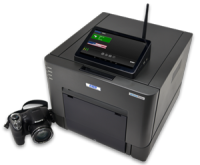 The DNP ID400DC2 is a wireless ID and passport photo solution for professionals that includes a high-end Sony W710 camera with two Toshiba FlashAir SD cards (one for the camera and one for the printer). This unique function provides a simple, direct, and wireless solution that is fast, reliable, and convenient. Unlike other systems which require the need to remove a memory card to insert into a kiosk or work around camera cables. Producing a passport or ID photo is easy with the DNP ID400DC2! The DNP ID400 includes face recognition technology that auto-detects the position and size of a face in the image data auto-adjusting the image size to match the ID photo layout selected. Choose from 22 build in ID photo layouts including US and Canadian passports! You can also create your own original layouts with the supplied Utility Software. Additional features include print and store (USB flash drive required), logo printing, and printing images from an SD or USB flash drive. The DNP ID400DC2 includes two FlashAir WIFI SD card to work wirelessly with many cameras on the market. The unit works with most commercially available cameras which are capable of accepting a SD card and support DPOF (digital print order format). With its automatic layout function installed in the DNP DS-ID400DC2, there is no need to perform layout processing, the DNP ID400DC2 auto-adjusts the image size to match the ID photo layout selected. Face recognition technology built-in to the DNP DS-ID400DC2 auto-detects the position and size of a face in image data to ensure correct placement. The US and Canadian passport size photo formats and other formats used by most major countries around the world are pre-installed in the printer for simple and accurate passport photo printing. A software is also available for the unit to create customized layouts with logos for the unit. This feature enables color, dark/light, gamma, and sharpness adjustments from the MENU function of the printer.